In Joe Haldeman’s classic 1974 novel, The Forever War, an overpopulation crisis a few centuries in the future makes homosexuality a moral and cultural imperative. The novel’s (heterosexual) protagonist, born in the 20th century, is thrown into this world as a result of time dilation while he is participating in an interstellar war. In an almost complete inversion of norms, he finds himself desperate to fit into a society in which his sexuality stigmatizes him. The Forever War was one of the first—and most famous—novels that explored how human beings would react to a social world in which certain basic assumptions were not simply altered or erased, but reversed. Fadi Zaghmout’s accomplished novel, Heaven on Earth is perhaps the most recent addition to this tradition. 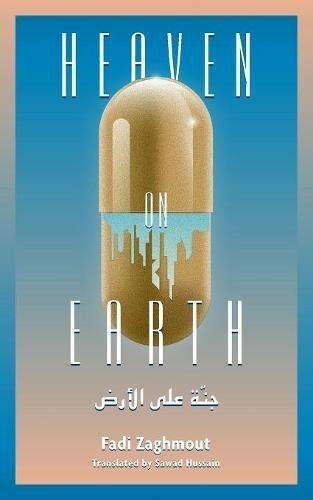 Heaven on Earth is set in Jordan at the end of the 21st century, where society has been revolutionized by the invention of an anti-ageing drug. The premise, of course, is not new to SF; its most famous iteration, perhaps, was in James Blish’s Cities in Flight. But while Blish’s novels simply used anti-ageing as a launching pad for an operatic, centuries-long journey through space, Heaven on Earth undertakes a thoroughgoing investigation of what a society—similar in other respects to our own—would look like if ageing and death had finally been conquered. How would society deal with the problem of overpopulation? Would anti-ageing be allowed only to a select few, or would it be accessible to everyone? What would it do to our concepts of time, of accomplishments, of love? How would generations relate to each other? What new cultural tropes would spring up, and what would they replace? What other technological advancements would exist at the time, and how would anti-ageing fit with them? From the thickly concrete to the abstractly existential, from society’s formal, legal responses to subtle alterations in human psychology, Heaven on Earth confronts—and deals with—fundamental transformations in an entire way of living. The result is a crowded canvas in which not everything is given the attention that it deserves, but whose ambition and boldness makes for a richly satisfying read. The result is an explosive concatenation of personal crises and political conflict in a world thoroughly out of joint. Zaghmout’s success lies in capturing a society at the exact moment at which its contradictions have reached the point of rupture, but before the point of resolution (whether violent or otherwise): a society in which contradictions are not held in balance, but clash and erupt into frequent conflagrations. This too is introduced, and then left dangling, almost as if it were an afterthought. One is almost left wishing that Zaghmout, having taken the trouble to build a wildly fascinating but perfectly coherent near-future world, would then take some of these passing ideas to their conclusion; but that is a minor quibble with a work that, for the most part, is unstinting in its ambition, and succeeds in its execution. A parting word on the book’s setting: in a recent essay, Sinead Murphy wrote about how the set of events called the “Arab Spring” have cast a long shadow over the form and content of the Arab SF novel. On a related note, books such as Iraq +100 explicitly engage with current events in the Middle East, such as the Iraq War. This is, of course, to be expected. SF, like any other genre of writing, cannot detach itself from the material conditions prevailing in the society that it grows out of. There is a risk, however, of literature then becoming too closely associated with a set of events that have acquired particular salience; to think, for example, that contemporary Arab SF must necessarily be related, in some way, whether in hope or in cynicism, to political turmoil, war, and the imagination that gave birth to events of the Arab Spring. This would be both untrue and reductive, and novels like Heaven on Earth ensure against such lazy generalizations. While the novel is explicitly and self-consciously set in Jordan, the themes that it addresses, for want of a better word, are as close to universal as it is possible to be. This doesn’t mean, of course, that the novel’s setting recedes into the background—quite the contrary. For example, one of the core plot points of Heaven on Earth is a reality show where contestants, drawn from poverty and destitution, have their ages gradually reversed, with one lucky winner being “allowed” to start live over in comfort. Such an event, presumably, would feel out of place if the novel was set in the more affluent societies of the contemporary West as they are regularly portrayed in literature and film, (that is, the societies we are familiar with today, and not the dystopias of The Heart Goes Last or even The Hunger Games); the crucial point, however, is that Heaven on Earth defies easy or thematic classification, and in doing so, speaks strongly to the vivid diversity of contemporary Arab SF.